It’s the time of year to start thinking about your healthcare coverage. The 2019 Open Enrollment Period runs from Thursday, November 1, 2018, to Saturday, December 15, 2018. Healthcare consumers can choose from an HMO (Health Maintenance Organization), PPO (Preferred Provider Organization), or POS (Point of Service) plan. And, just as with any big decision to be made, there are pros and cons to each one. An HMO works well for many consumers as it offers a lower cost compared to a PPO, but it does have its restrictions. HMO participants are confined to selecting a Primary Care Doctor who is in-network or must agree to pay all costs out of pocket for services out-of-network; limiting the pool of doctors by which a participant can be treated. Consumers should also be aware that with an HMO, all in-network doctors are “Capitated” to a specific lab, radiology facility, and physical therapy office, and should check which facilities the Primary Care Doctor of choice is capitated to before making their selection. Also note, a visit to a specialist is not covered without a referral; making patients reliant on their Primary Care Doctor’s approval to see one. The standard HMO offers consumers the benefit of full healthcare coverage for less money, but if you prefer to go to the doctor or specialist of your choosing than a PPO might be the better plan for you. The monthly cost for a PPO can be cheaper than the HMO cost per month, but overall a PPO is more expensive, as they require higher deductibles and cost more out of pocket at the time of healthcare utilization. For example, if you go to the hospital or undergo surgery, you are required to pay out of pocket until your deductible is met. The good news is once you’ve reached the deductible your healthcare insurance will cover the remaining costs. And, there are no restrictions! You can go to the doctor or specialist of your choice and visit any facility for treatment. A POS is a hybrid of the HMO and PPO plans. As with an HMO, consumers are required to select an in-network doctor to be their primary care provider, and in most cases, a referral is needed. Similar to the PPO plan, participants can go out-of-network for healthcare services but require authorization from their Primary Care Doctor, who again, must be in-network. POS health insurance may provide a middle ground for some consumers, but a major downfall is that the cost of out-of-network providers can also be high. Members can expect to pay upwards of 30 to 40 percent of the bill out of pocket. If a member chooses to see an out-of-network healthcare provider, they will have to pay the provider’s fees upfront, which can become a financial strain. Participants will get reimbursed after they’ve submitted the necessary paperwork and wait for the insurance company to make a decision. 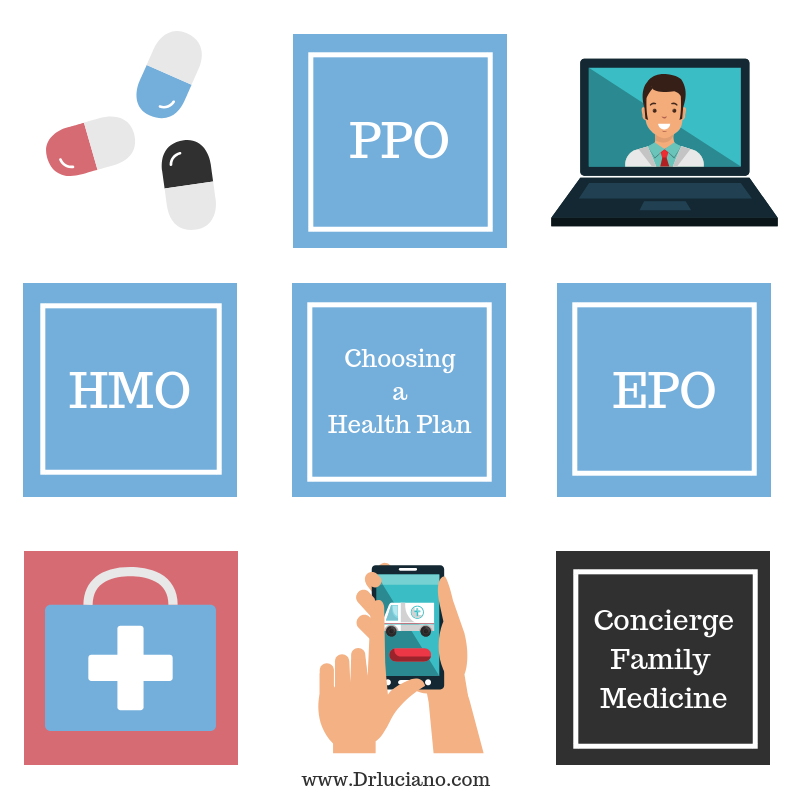 If you are considering switching to a higher level of healthcare service such as Dr. Luciano’s Concierge Family Medicine, a PPO plan would be the best choice. Dr. Luciano is considered out-of-network and does not take insurance. The PPO plan allows unrestricted access to specialists without the need for a referral. If you have an HMO plan, you can only be referred by an in-network doctor, and since Dr. Luciano is out-of-network, the referral would not be processed and approved. Consumers will spend a few more dollars annually for a PPO plan, but they are free to seek out award-winning doctors, like Dr. Luciano who has an excellent reputation as being one of the Best Family Doctors in Bucks County. The specialized care provided by Dr. Luciano’s Concierge Family Medicine offers a more personalized and convenient approach to healthcare. Patients have direct access to Dr. Luciano 24/7 via cell phone or email. The friendly office staff is available to schedule same-day or next day appointments. Every patient is allotted a 30 to 60-minute session with Dr. Luciano to ensure a comprehensive and unrushed visit, thus preventing a crowded waiting room and long wait times to see a doctor. Of course, there is also the option to forgo the office visit in exchange for a virtual visit with Dr. Luciano – great for patients who are traveling or too busy to come to the office. For consumers who want the best possible preventive and health-promoting services, while remaining within budget, there is an HSA (Health Savings Account). It is a tax-exempt medical savings account, often used for those enrolled in a high deductible plan like a PPO or by individuals who wish to join a Concierge Medical Service. The HSA is used to cover expenses such as an executive physical and telemedicine services with their Concierge Doctor. Members of Dr. Luciano’s Concierge Medical Practice pay a fixed annual medical fee, so consumers can determine how much to put in the HSA for the upcoming year. If you are interested in becoming a member of Dr. Luciano’s Concierge Family Medicine Practice so that you and your family can receive exceptional healthcare that is convenient and personal, your best choice for insurance would be a PPO plan for 2019.